Open the can of crescent rolls and separate the dough according to the instructions on the package. Place 1-2 tablespoons of the cut ham in the widest part of the triangle. Fold the corners over the ham. Roll the dough, beginning from the widest part that has the ham and ending at the tip. Fold down the sides if necessary and place on the baking sheet. Repeat the process with the remaining pieces of dough. Bake for 15-20 minutes or until the crescent rolls are golden. Remove from oven and brush with melted butter. Serve. You can use a food processor to shred the ham and give it the texture shown in the picture. 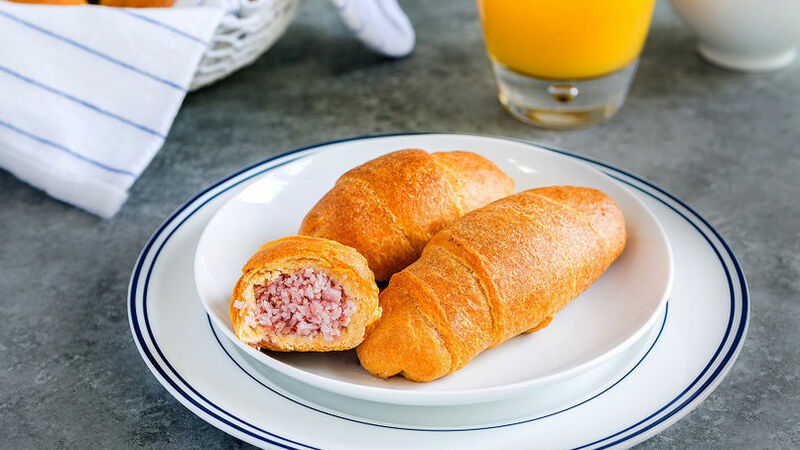 Cachitos, or crescent rolls, are one of the most popular breakfast foods in Venezuela. You can find them in any bakery and they’re truly irresistible, especially if they’re fresh from the oven. As most Latin Americans living in the United States, I’m always looking for ways to make the little treats that remind us of our native countries. In my case, I find that it also needs to be easy and quick. And that’s why I thought of these easy crescents. My family loves them! I make them during the week so the kids can enjoy them for breakfast or in their school lunch. Try them!